Make sure plate is clear of all smudges. Clean the plate with dish soap and allow to dry. Squirt the paints onto a pallet or plate to keep the colors separate. Take paint brush and swirl it into one of the colors that you would like to be one of the Turkeys feathers. 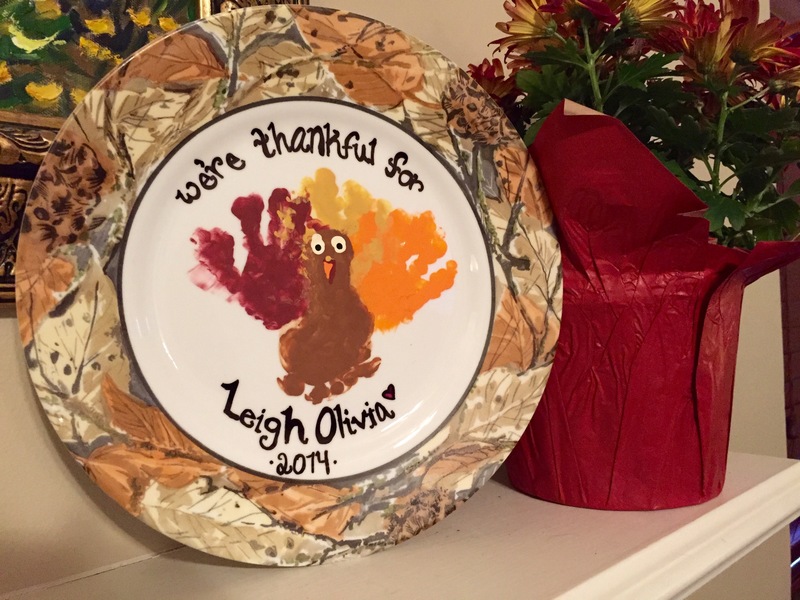 Once plate is completely take the paint brush and paint child’s hand. Let your child feel the paint and experience the fun of having the new texture in their grasp. For toddlers and older children have a conversation with them about how it feels. Asks them if they can describe it and work with them to build their vocabulary about the new experience. Now take the child’s hand and place it near the top-center-middle of the plate. Then clean the child’s hand with a baby wipe of wet cloth. 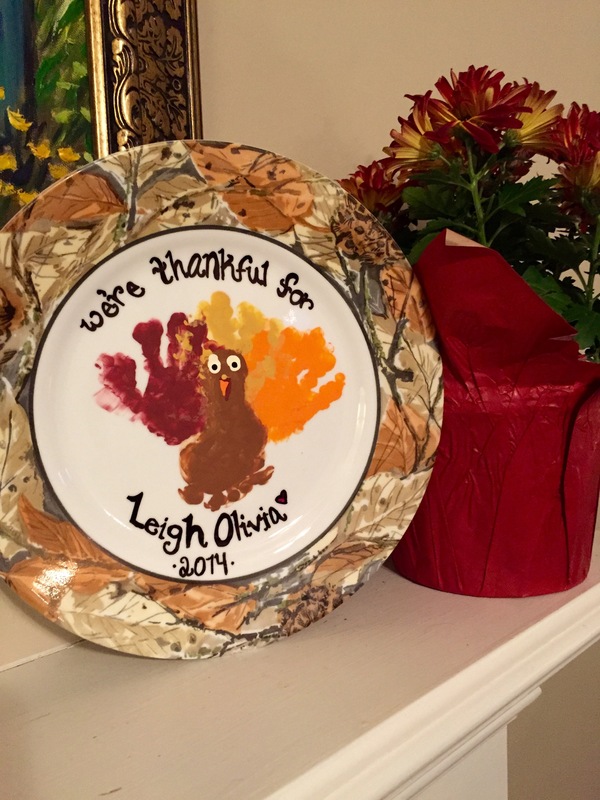 Then repeat the steps 3-5 with the other two colors that you and your child would like to be the Turkeys feathers and place the child’s handprints on either side of the first-middle handprint. Next take the paintbrush and dip it into the brown paint. Then swirl it onto your child’s foot. Again, if your child is older ask them about what it feels like. Do they think the brush tickles? Do they like the feeling of the smushy paint between their toes? Why? Why not? Now place the child’s foot, toes down in the middle of the plate. It’s okay if the foot print overlaps on the center handprints. Allow the hand and foot prints to dry as you clean your child’s foot. Once the prints are dry take the child’s finger and let them dip it in the white paint. Then have them put their finger print on the footprints heels. Then take a toothpick and dip it into the black acrylic paint. Now place a little dot of the Black in the middle of the child’s white fingerprint to create a little Turkey eyeball. Then take the toothpick and dip it into the orange paint and make a little triangle right underneath the eyeballs you just created. Again, take the toothpick, one last time. and dip it into the red paint. Then trace it right along the ridge and down the side of the orange triangle that you just created to complete your Turkeys’ gobbler! Allow your Turkey’s face to dry completely. Take your Black Sharpie Marker and write a message of gratitude above and below your Turkey. Preheat your conventional oven and bake your plate at 350-345 degrees for 30 to 45 minutes. Turn off your oven and allow the plate to cool in the oven. Once the plate is completely cool take out and display somewhere for your family to enjoy, and your child to take pride in their art work and remember that our greatest blessings are those things in life that God has blessed us with where no monetary value could ever place their worth; our relationships and those memories we make with those we love. The finished product completed by my favorite little Turkey this year.